Waimea Theater manager Thomas Nizo. When TV sets were still science fiction, movie theaters were kings. 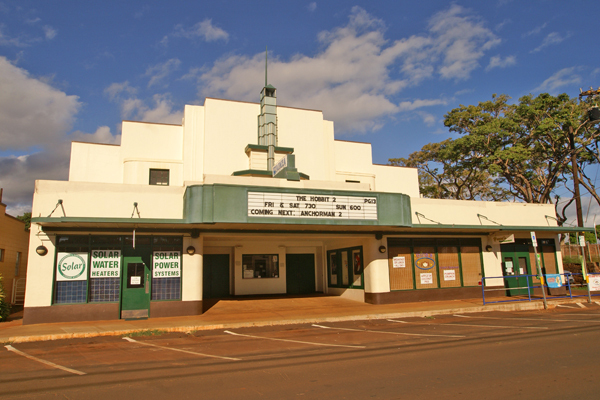 On Kauaʻi, several towns had a movie theater, but only Waimea Theater, which first opened on Sept. 2, 1938, survived the changing times. Kapaʻa had the gigantic Roxy Theater, which became a casualty of Hurricane ʻIniki in 1992. 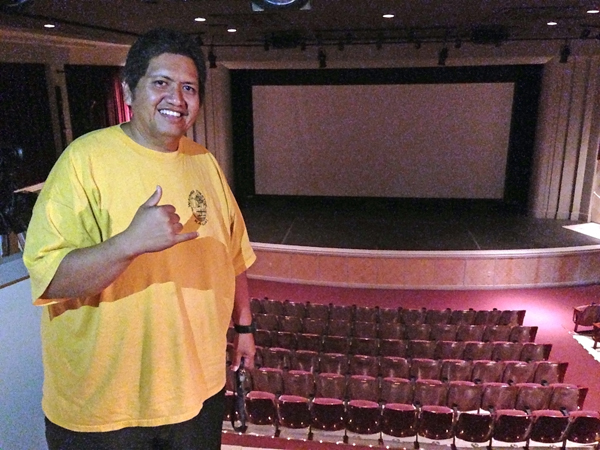 Hanapepe had two movie theaters, and Kaumakani and Kekaha had one each, according to Thomas Nizo, manager of Waimea Theater. Kilauea and Lihuʻe theaters are still standing. But the North Shore facility became a church and the Lihuʻe building was converted to a senior housing in 1997. Waimea Theater, the lone survivor from that art deco era, still has its original modernistic façade, velvet curtains, a couple rows of rattan seats and a glass enclosed box office. Though it originally had 500 seats, the historic 270-seat theater pretty much looks like the same when it was shut down 42 years ago and its silver screen went into hibernation for 26 years. “It’s a blast from the past,” Nizo said of the theater. The theater, however, narrowly survived the test of time. In 1972, hurt by the advent of TV, it was converted to a warehouse and retail spaces. Twenty years later, after ʻIniki passed through Kauaʻi, Waimea Theater almost suffered the same fate of Kapaʻa’s Roxy: It was threatened with demolition. Thanks to the vision of the West Kauaʻi Business and Professional Association, and help from the federal and local governments, Waimea Theater reopened with all its glamour in 1998 after a $1.2 million makeover. The theater is pretty much one of the cornerstones of Waimea, according to Nizo. And it’s more than just a theater, he said. Besides showing movies, the theater is a place for plays, concerts, musicals, corporate events, candidate forums and even hula. “It’s definitely a multi-dimensional facility,” Nizo said. Recently, with financial help from Mayor Bernard Carvalho Jr., the theater entered into the digital era. In January 2013, the entire movie industry went digital, according to Nizo. Prior to that, the county, which owns the facility, provided funding to switch from film projectors to digital ones. Carvalho also provided money for a seven-speaker surround system and a full editing video system, Nizo said. “We edit our own commercials,” he said. The majority of movies shown are family oriented, ranging from G-rated to PG-13, though every once in a while an R-rated blockbuster makes its way into the theater, according to Nizo. 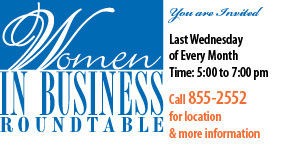 Visit www.waimeatheater.com for a movie schedule.